The Australian payments market provides business and regulatory initiatives that serve as examples for other markets. London, 20 June 2017 – Australia is leading innovation in areas such as contactless payments, bill payments, digital commerce, and point-of-sale applications, and the market is ready to make the next transformation with the start of the New Payments Platform in October this year. The Reserve Bank of Australia was one of the first regulators to introduce interchange fee regulation back in 2003, and regulators around the world have since introduced interchange regulation following the Australian example. Can an assessment of today’s Australian market offer an idea of what is in store for payment markets in other geographies? Based on conversations with representatives from leading banks, fintech companies, public authorities, and industry associations, this report surveys the Australian payments market for key trends and initiatives. This 40-page Impact Report contains 14 figures and five tables. Clients of Aite Group’s Retail Banking & Payments service can download this report, the corresponding charts, and the Executive Impact Deck. 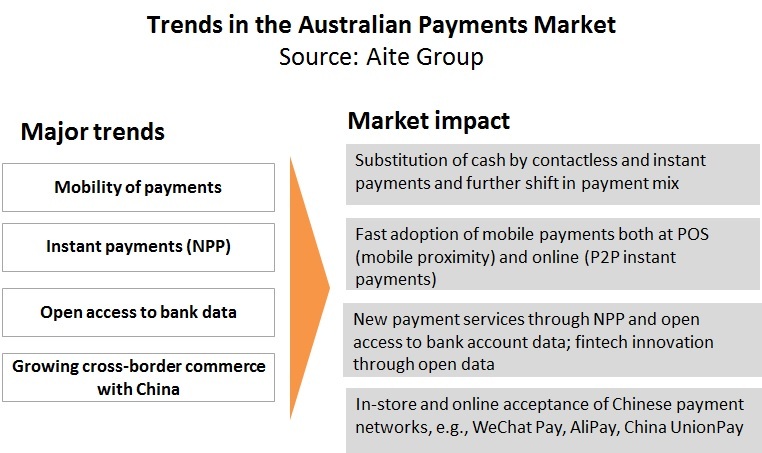 This report mentions Adyen, Aevi, Airwallex, Alibaba Group, Alipay, American Express, Apple, Australia and New Zealand Banking Group (ANZ), BPAY, BlueSnap, Cuscal, Diners Club, Australian Payments Network, Citibank, Commonwealth Bank of Australia (CBA), Envestnet Yodlee, ePAL, EY, Ezypay, Fabric.io, Fintech Australia, FirstData, FIS, Gemalto, Mastercard, MobilePay, National Australia Bank (NAB), NPPA, Promis, Quest Payment Systems, Rambus, Reserve Bank of Australia (RBA), RoyalPay, Samsung, Square, SWIFT, Tyro, UnionPay, Verifone, Visa, and Westpac.